Star Trek: The Next Generation is my favorite television show of all time. That doesn’t mean it is completely without flaws. It just means that I love watching it, no matter what episode, no matter what’s happening. I have been getting the Blu Ray seasons and I figured why not go through the series, a la AV Club (great reads on every episode, there), and talk about my thoughts? Maybe you’ll enjoy them. I’d love to read what you have to say on an episode-by-episode basis, as well! I’ll give a reflection to each episode, and then I’ll give it a grade like we’re in school (A-F) based on what I thought overall. Yes, that’s copied off of AV Club, and I acknowledge their influence here. I’m starting in Season 2 because that’s where I am. I will one day go back to season 1, if demand is there! There are SPOILERS in what follows, of course! Flying energy-star thing impregnates Troi because it wants to experience what it’s like to live as a human (and betazoid, apparently). Wesley Crusher has to decide whether to stay with the Enterprise or leave to join his mom who is now heading some medical thing in starfleet. Speaking of the doctor, we now have Doctor Pulaski who is mean to Data. The Enterprise is transporting some volatile bacteria or somesuch, which is influenced by energy-starchild, so energy starchild immediately decides to die, thanks Troi, and takes off. Crusher decides to stay. On that note, this episode is terrible. The scene in which Counselor Deanna Troi is being ignored by all the guys sitting around talking about what she should do with her baby actually has some poignancy to it as their words echo over her zoomed in face as they consider what she can or should do. I think there’s some attempt at a commentary there on how too often women’s voices are ignored, and the fact that Troi speaks up to ultimately make her decision (and Picard immediately says that settles it) is a near-nod to the show’s attempts to have gender equality, but against the backdrop of the whole episode, it falls flat. There is no real acknowledgement of the notion that this alien creature violated Troi. Yes, it ultimately leaves her without a trace physically of its presence, but what of the mental scars from having an alien impregnate you, growing quickly to love it like your own child, and then watching it die in the space of two days? The episode is silent on this, and I find that pretty astounding. Also, Dr. Pulaski is introduced in the most extremely obnoxious fashion possible. She’s completely dismissive of Data and scorns him for being concerned with how to say his name, and her bedside manner is just ridiculous. I think I remember her growing on me but wow this is a terrible start. There’s a “hole” in space that is neither matter nor energy. 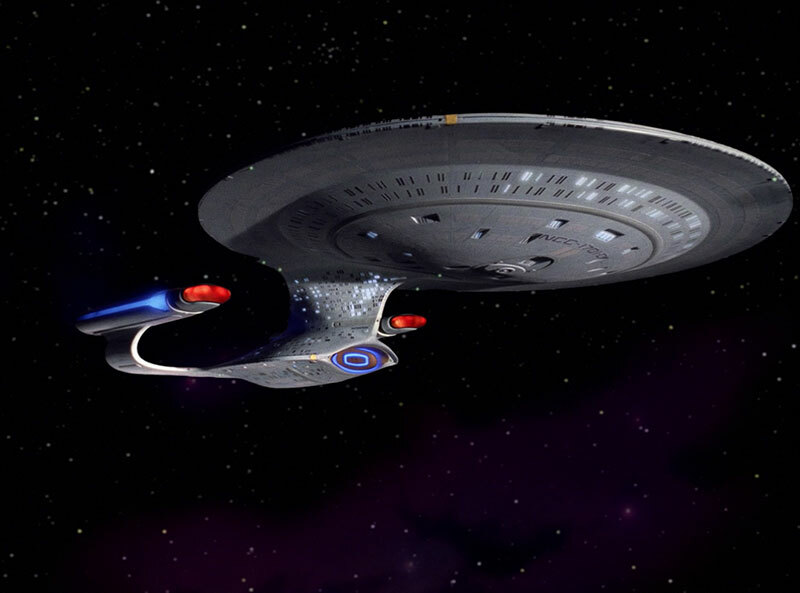 The curious crew of the Enterprise goes to explore it only to be enveloped by it. After some probing and an away team of Worf and Riker which has some spooky moments of exploring a sister ship of the Enterprise and the away team seeing themselves in two places, the crew discovers they are essentially being toyed with as if they were rats in an experiment. A godlike being reveals itself and demands to know more. It is curious, particularly about death, and kills a redshirt (sorry redshirt!). Then it decides to know more and wants to kill about 1/3 to 1/2 of the Crew. Picard will have none of it and decides to blow the ship. With only seconds left, the godlike being releases them, Wesley is pumped about the “bluff” Picard pulls while Riker points out he doesn’t think it was a bluff. Godlike being converses with Picard, the latter of whom notes they share curiosity. You know, when I started watching this with my wife, I initially groaned internally, because I remembered really not enjoying this episode very much. But I also had forgotten the plot, and as I watched it with seemingly fresh eyes, I realized it was actually a pretty interesting episode. Sure, it has the same godlike-being tampering with random human ship plot we’ve seen a bunch in Star Trek, but the way it plays out is really fun. Worf/Riker exploring the ship is actually pretty spooky at points because you know something is wrong but can’t quite put a finger on it. The big reveal in which the godlike being is not as ridiculous as it is in other “godlike being” episodes, and it actually is put off long enough to allow the mystery to develop. Picard’s reaction is so awesome, too: “No, I’m not going to let you experiment on my crew, we’re gonna blow ourselves sky high instead!” (Not actual quote.) Seriously, very in-character for him. You’d think that there’d be a bit more of a protest, however, and that negatively impacts the believable factor of this episode. Just an aside: I’m not saying “believable” is something that can be applied to “The Next Generation.” It’s sci-fi, there is major suspension of disbelief throughout. However, the way characters act through the show and our own experiences about how people react to situations is what allows us to have some sort of notion of “believable” (or not) when it comes to certain things. That’s what I’m saying above when I say it isn’t as believable as it may have been. Overall, a pretty fun episode with a few flaws, including the really weird look of the godlike being.